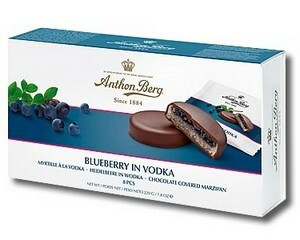 Anthon Bergs unique and delicate marzipan discs with Blueberry jam and Vodka are known all over the world. The discs have a Blueberry jam centre and marzipan soaked with Vodka. Finally, they are covered with a thick coating of high quality dark chocolate. All the discs are individually wrapped.